* - K.O. game in minutes with/without increment time per move Select side color for Jester. * Then click [New Game] button to start a new game. * To play a move, click the piece to move and click the destination square. 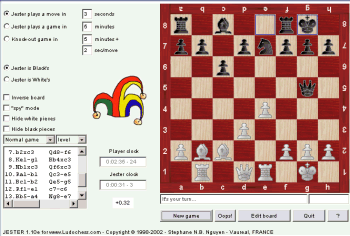 - Normal game : the normal chess game. - Fantasy style : like as normal game, but sometimes Jester plays a strange, an unexpected move (not really the best move) which completely baffles you and "puts fire on board". - Clownish style : like as normal game, but when Jester gets a decisive advantage, he'll play a very bad move giving you a chance to win. - One-Step-Beyond : white pawns are on the 3rd rank, black pawns on the 6th rank. - Vaureal Dawn : knights & bishops switch their initial position on board. - Crazy Horses : bishops are replaced by knights. - Lethal Amazones : knights & bishops are replaced by queens. - Click [Edit board] button to enter in edit mode. Select a piece with [Select Piece] button and click on the square to place a new piece. When all done, click again [Edit board] button to leave edit mode. Then, click [New game] button to start a game with the new position. White side always plays first. Take back last player move. Not allowed in K.O. game.